Home / Fabric Lines / Introducing Free-Motion Fantasy! Happy summer everyone! 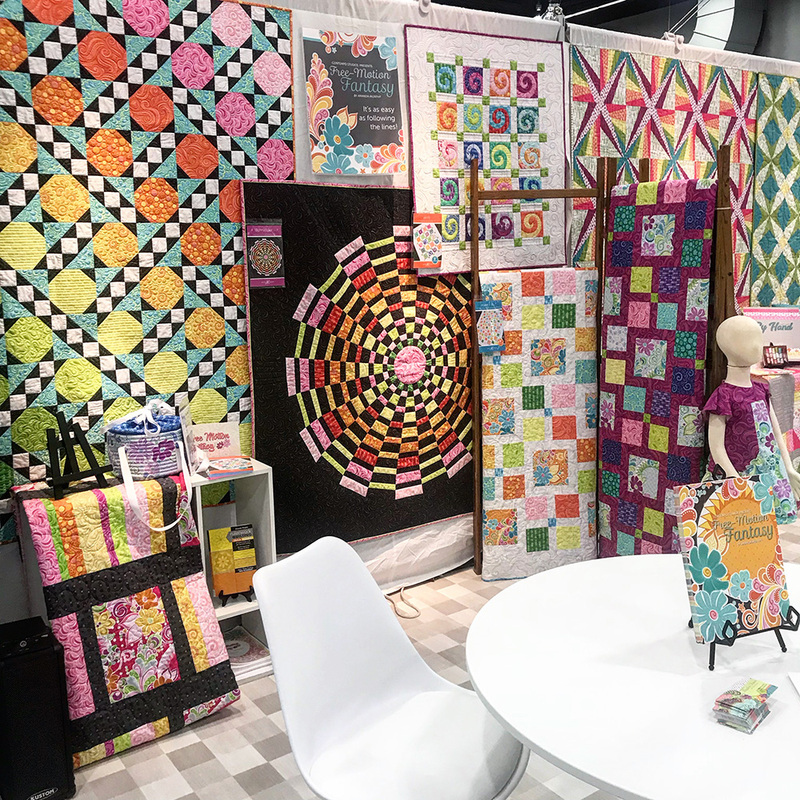 It has been awhile since I’ve posted and I have some excited new things that I wanted to share – including my Free-Motion Fantasy line for Contempo of Benartex and patterns that debuted at Spring Quilt Market just a few weeks ago. 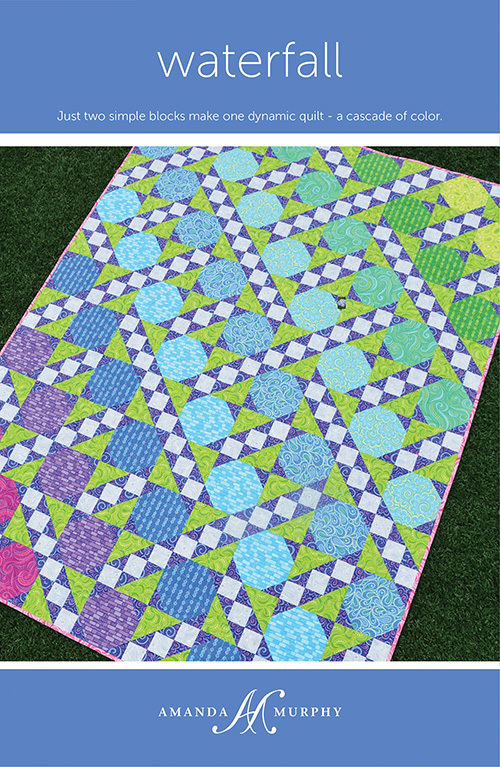 Free-Motion Fantasy at Spring 2018 Quilt Market! Of course, all of these pieces were pieced on the BERNINA 7 Series and quilted on the amazing BERNINA Q24. 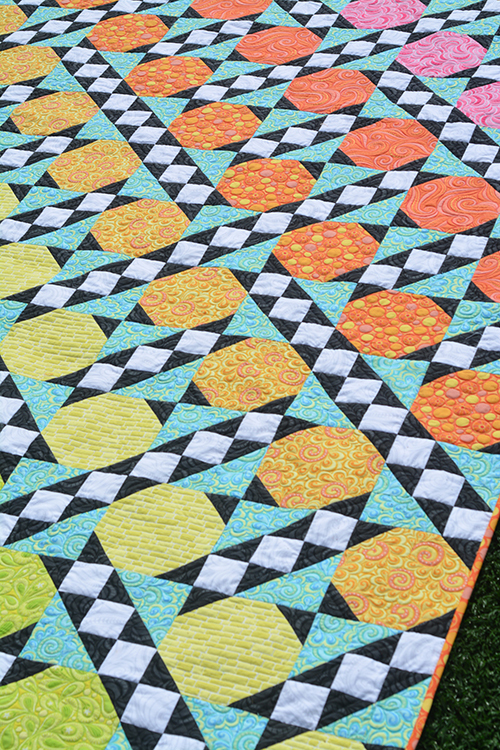 Even though I’m hard at work on some BERNINA University projects (that have me so excited I can barely breath), I’ve been wanting to share my new work with you and hope that you love it and that it will help you learn to free-motion quilt! 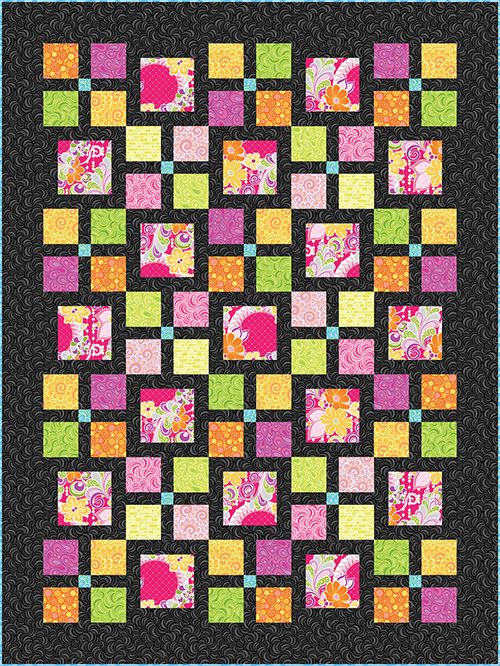 Some of you might remember that awhile back I did some quilting panels for BERNINA where you could follow the lines to quilt some common free-motion motifs. Well, in my Free-Motion Fantasy line I’ve expanded upon that concept to present an entire line of free-motion prints. The feature print comes in four color stories that are inspired by the seasons and features feathers, swirls, cross-hatching, leaves – you name it! 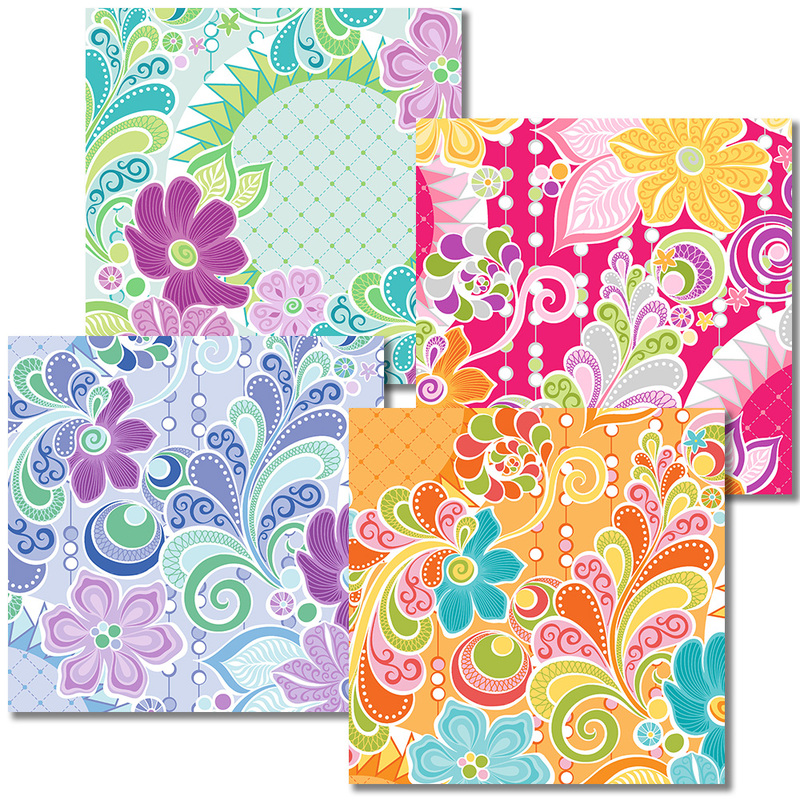 Then there is a supporting cast of a rainbow of prints in a full spectrum of colors, enabling you to create a unique palette no matter what feature print catches your fancy. 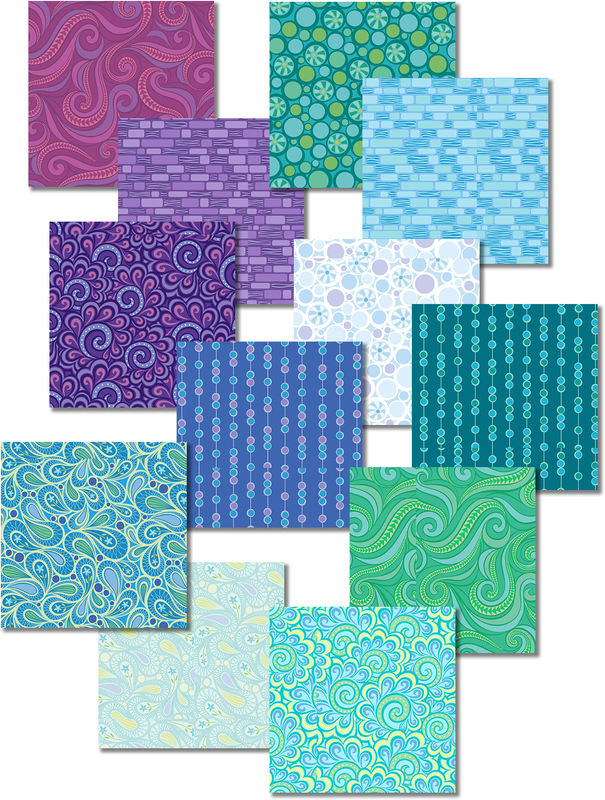 All of these prints are inspired by free-motion motifs that I like to use, so they are great for practicing shapes commonly used when quilting. There are also four shades of grey in the collection to serve as a backdrop for these exuberant hues. 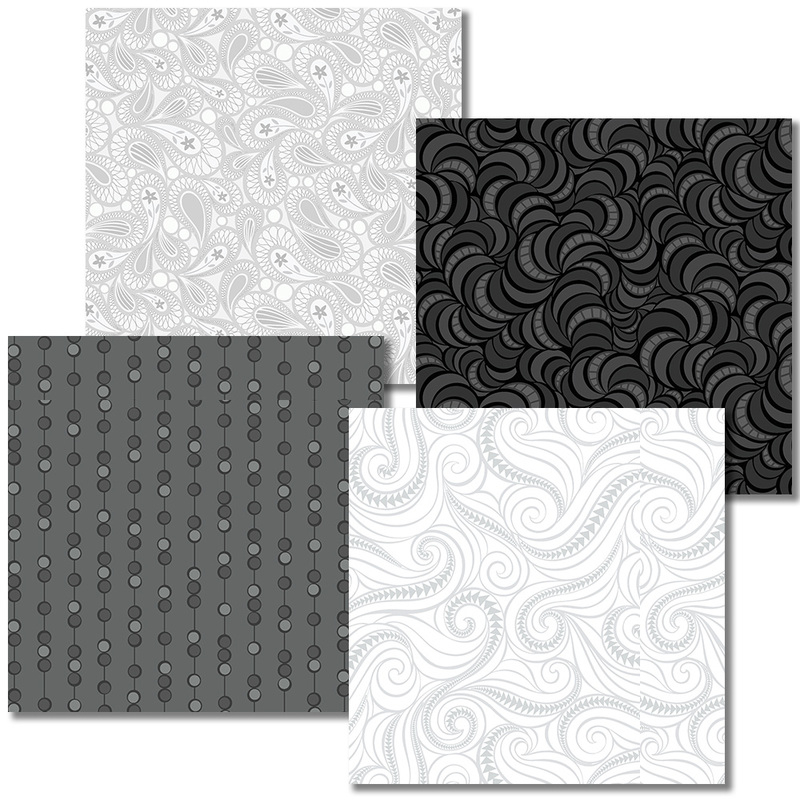 The fabric can be ordered by shops from Contempo of Benartex now and will ship in July/August. I’ve developed four patterns to go with this collection. (They are beautifully printed – the printer really outdid themselves this time!) And guess what? They are ready to ship NOW! First up is Make It 8. This is a really simple two block design that is perfect for showcasing a feature print. It uses 8 fat quarters (hence the name) plus a little bit of accent fabric and of course a background. I designed it in four color stories. The first is autumn, which is shown on the front of the pattern. Spring is shown on the inside – the colors are just so clear and vivid. I wish you could see it in person! Benartex/Contempo did an excellent job with the printing. I designed two more color stories for the other feature prints. I didn’t make samples of them but the SKU information for all is included in the pattern. Next up is Technicolor. It was my “showcase quilt” this time round. 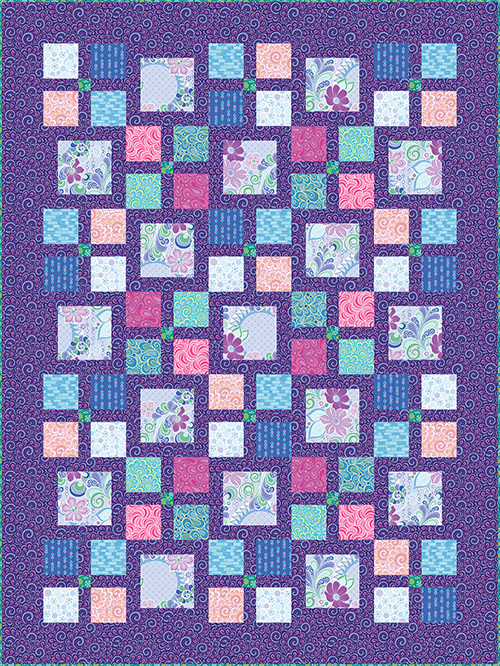 It is a really a simple wedge quilt that is cut from strip sets. 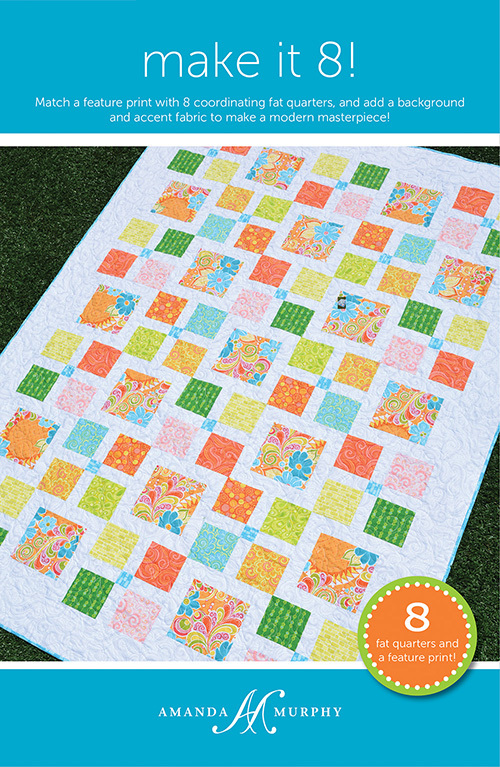 The best part is that when you make this quilt you end up with a second set of strips in opposite colors that can be used for a second quilt! I can’t wait to piece this one up in my fabric that will debut at BERNINA University as well. It will be completely different and I’m excited about it. Then we have Waterfall. I think that this might be my favorite in terms of the way it showcases the colors of this collection. 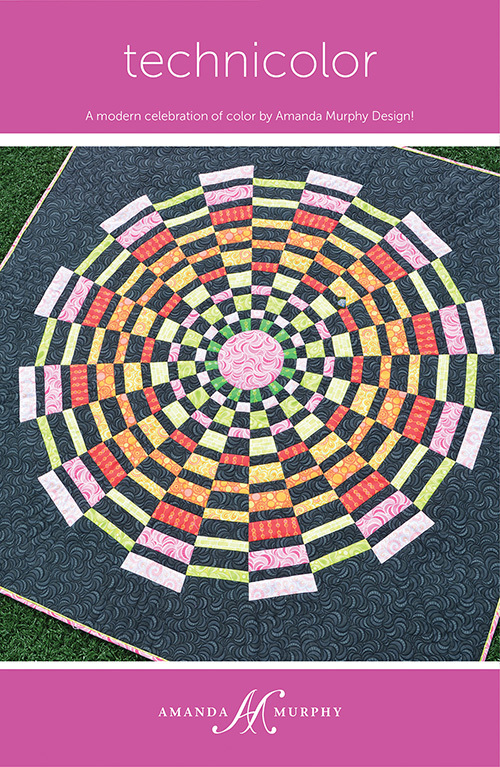 It is a two-block quilt again that looks more complex due to the way it is laid out. The cool version of Waterfall is shown on the cover. I also did a warm version of Waterfall, which I quilted by “following the lines on the fabric”. 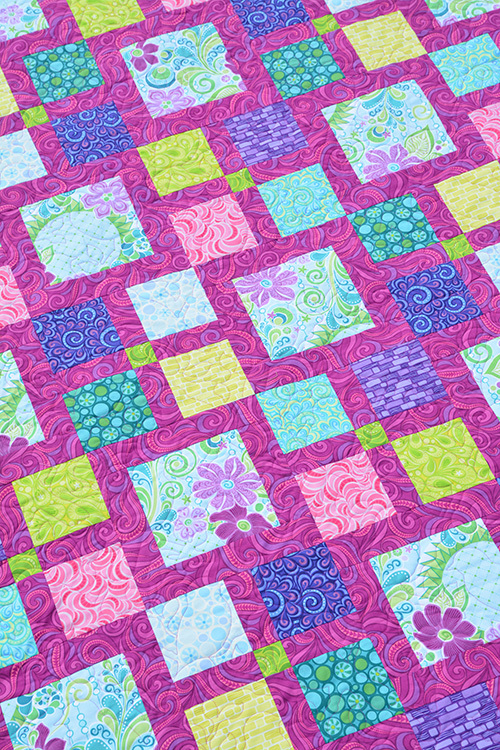 I hope this fabric makes you want to quilt like it did me! Waterfall in the warm colors of Free-Motion Fantasy; note the quilting on this one is following the designs in the fabric! Last but not least is Swirls. 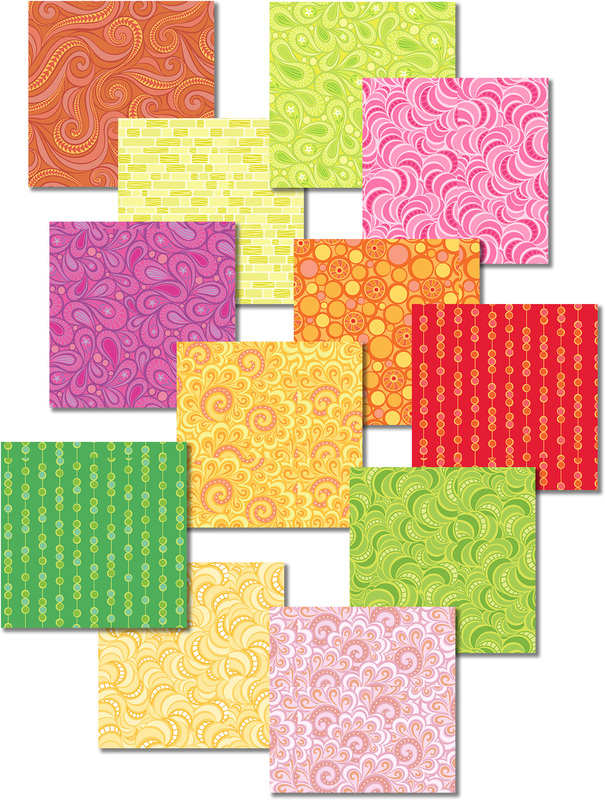 This pattern is a fun 5”-square friendly pattern that is very quick to cut out. It actually is a reprise from a Craftsy class on applique. 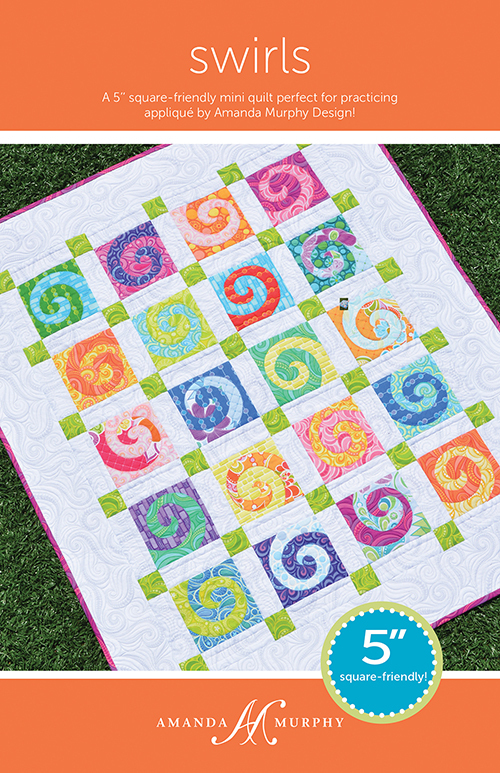 I’ve had so many requests from people who have wanted to purchase this pattern separately that I went ahead and released it that way – Swirls just seemed right for this collection. So, that’s a wrap! 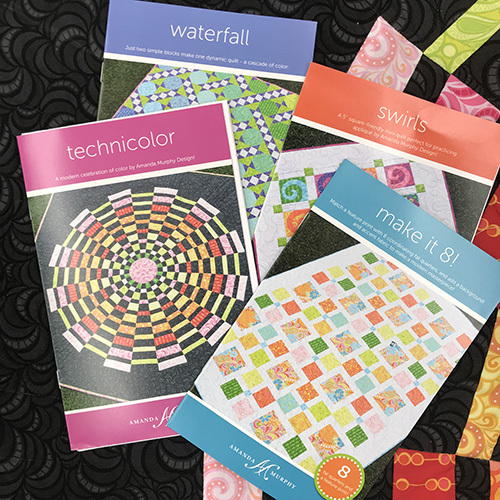 If you are inspired please ask your local shops to order Free-Motion Fantasy and the patterns. This is the perfect time for orders to be placed – while the line is still available in full I don’t stock fabric so as not to compete with shops (please if you can support your shop! ), but if you don’t have a local shop you can find the patterns in my online store. The links in this post are to printed patterns but you will find PDFs up there as well for those in far-away locations. Later in the summer once the fabric releases I’ll do a giveaway and also post the list of shops that have ordered the collection from Benartex. Have a happy start to your summer and your summer projects too!